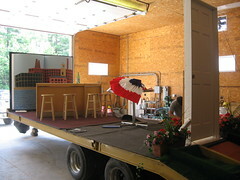 A month or so ago, I received an email from another librarian, asking about my library's Fourth of July Parade float she saw on flickr. 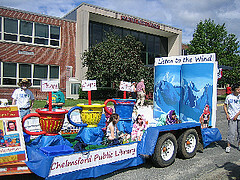 Some time in the past, someone built us a six foot tall open book, and we repaint the book each year with our float's theme. Her question was this: could I provide pictures and measurements, so that they could build one for their library too? I am always happy to share, but it turns out, none of my coworkers could even remember who built the thing, or how long we've had it - so of course, we have no plans or measurements for it. Also of course, being April*, the book is buried in our storage area under all kinds of stuff, so I'm not really able to get it out to take new pictures. I was able to take some measurements though, so hopefully the sketches below and the photos on flickr are enough if you're interested in building one for your library. 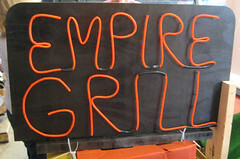 Everything is approximate, so don't be afraid to improvise and customize. 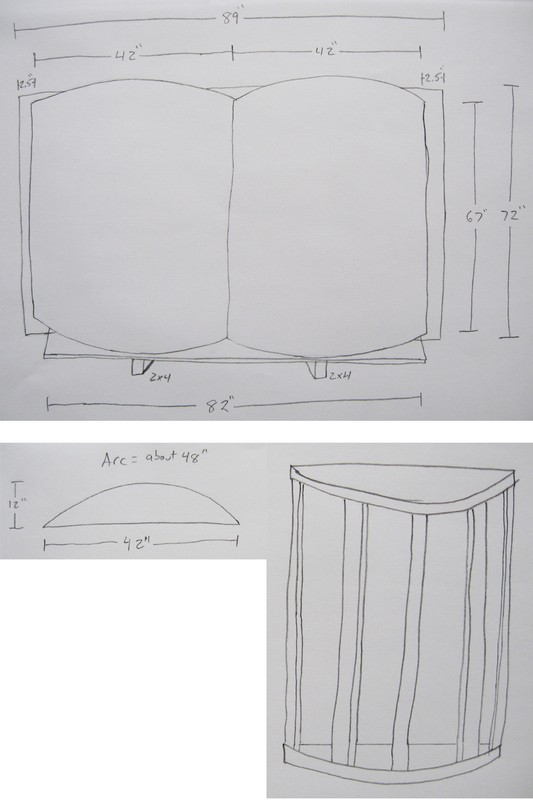 Oh, and all measurements are in inches, and the bigger version of the sketch is a little more clear. the body of the book itself is hollow (this is the curved cage-looking thing above right); each side is made out of two semi-circles of plywood (one top and one bottom), connected by 1x4s. The length of the 1x4s will depend on how thick your semi-circle plywood is (and how tall you'd like your book to be). Thin sheets of paneling are then bent around the front to form the surface of the "pages"
One nice thing about being a parade float is that, since most people are pretty far away from it, and the float is in motion, no one can see all the flaws: screw heads, chips, random wood nailed on to patch holes, etc. Just make sure the paint looks good, and the book will look very impressive. The more I look at this, the more confusing it seems - feel free to ask any questions and I'll do my best to answer them. *I thought this was a great blog post for National Library Week - what better way to celebrate libraries than building a six foot tall wooden book? I guess you could build a six foot tall wooden ereader, but then you'd have to get rid of it the following year and build a new one, because it would no longer be compatible with your float.